The half-day version of At Ease With the Media is perfect for providing one to three spokespeople with the skills they need to succeed with journalists. At Ease With the Media works best when spokespeople first complete the unique and innovative online media training program. With theory out of the way, practice soon begins. 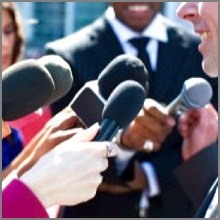 Ideally, each participant is interviewed four times, twice for the needs of print journalists and twice for broadcast. More practice equals more confidence for spokespeople and better outcomes for their organization. This can be accomplished with up to three participants in a half-day format, although larger groups can be accommodated (and all are eligible to complete the online program). There truly is no substitute for practice in preparing spokespeople to get it right when the spotlight’s on. Please feel free to examine the outline below. If you’d like to take your spokespeople to the next level, contact Eric. He’d love to put them At Ease With the Media. Introduction and brief review of online modules. Any lingering questions from the online program are addressed. Description of needs of print reporters, including two brief interactive exercises. First round of print interviews, in which participants learn to pause, answer the question and stop talking. Each interview is recorded; feedback is provided. Participants are provided with a model and process for preparing themselves and their messages for the remainder of interviews. This will be used to prepare for a specific issue. Second round of print interviews, in which the first step is built upon and participants learn to pick appropriate moments in which to “weave in” not “drive home” messages. Feedback is provided. Discussion of approach for sound bites, in which the participant learns to pause, answer and restate the question (or vice-versa), weave in a message and stop talking. Videotape practice for sound bite interviews. Live interview practice with video feedback.